**so sorry! I had this scheduled to post yesterday right when our segment began but I put the wrong year!! *** I will do the giveaway on this on Tuesday night (one week) when I get back at the same time as the giveaway before this! 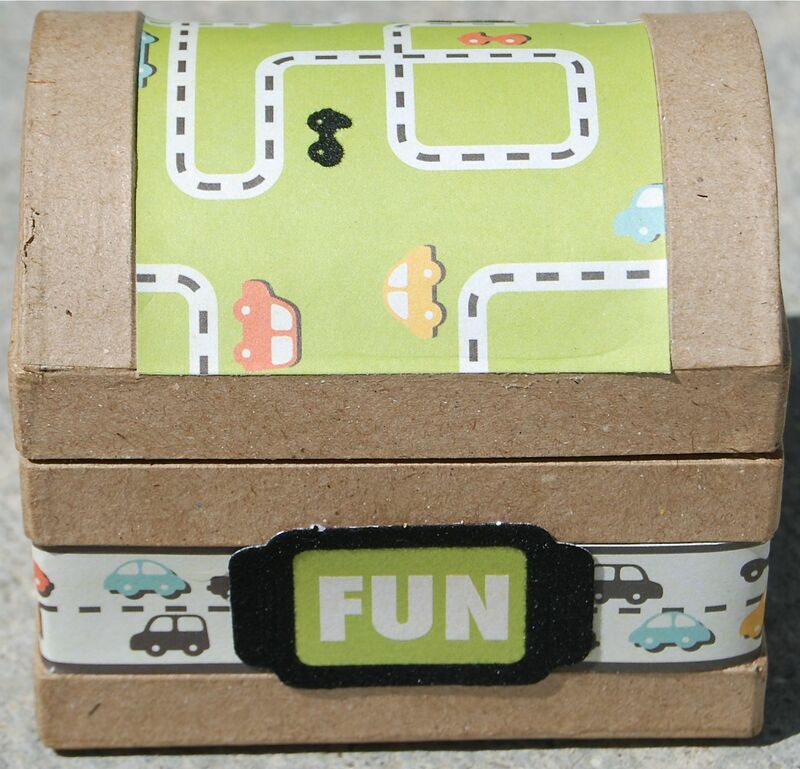 Treasure chest or any cute container that can fit in your glove box. Cover your container with scrapbook paper to make it festive. Fill the chest with paper strips of the movies you have brought. When it comes time to watch a movie, you can pick from the chest to avoid a fight! 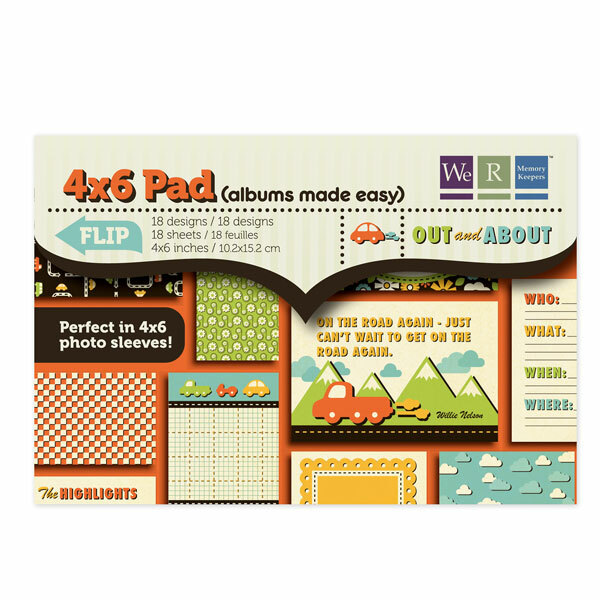 We R Memory Keepers out and about designer series pad. We R Memory Keepers 4x6 journaling cards. From the designer pad, chose the house/tree paper and cut as shown. Use the Orange paper and cut 1/2” larger in height. From the 4x6 tablet, pull the title. Cut the Orange paper to be 4.5x6.5 inches as a backing. Cut the bracket paper in half. 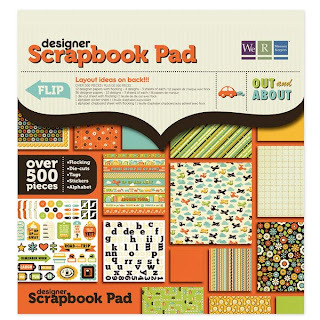 Assemble layout as shown using the paper, letters and tags from the designer series pad. Make signs backed with cardstock of pitstops you would like to make. As you make progress, move the car forward so your kids can see how far you are getting, maybe even avoiding the famous question, “are we there yet! ?” You can use the temporary hooks to hang this chart from your child's window with the temporary hooks. You can even get suction cup hooks from a home improvement store. It can serve as a window shade AND a progress chart! Cut paper to be the same size as the can (right below the silver on each side so it will lay flat). Cut a smaller paper that you can wrap around the middle or bottom, for accent. Tie ribbon around the can and attach the die cut tag. 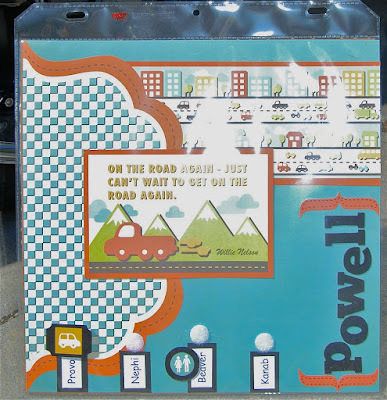 **OF COURSE you can always decorate these cans the way YOU like to have them! You can get as many cans as you have hours to drive. Every hour, open a new can. 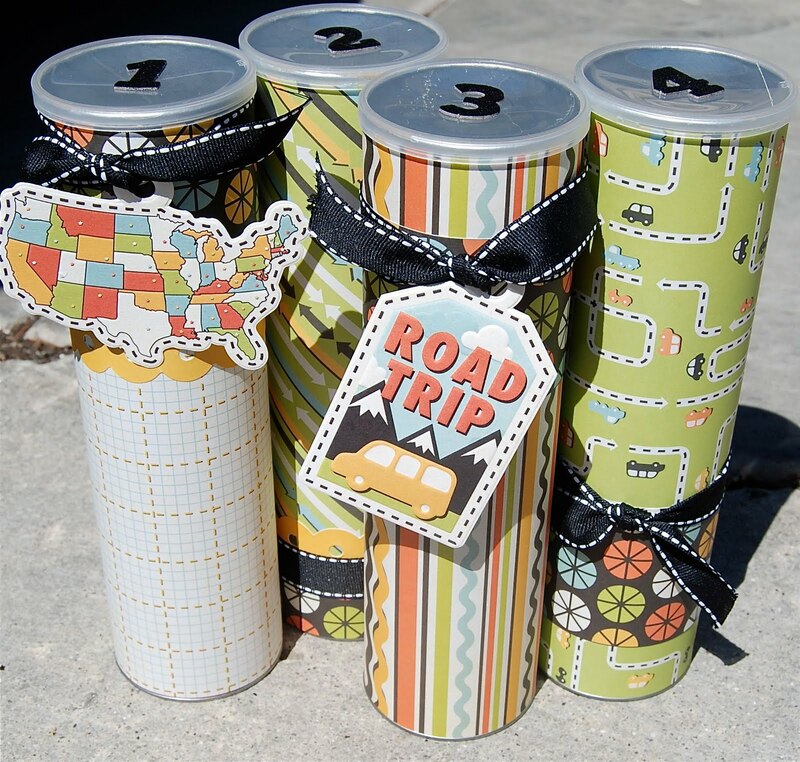 These cans are also handy because they can be stored in your door pocket easily and when brought out, easily fit in your cup holder! 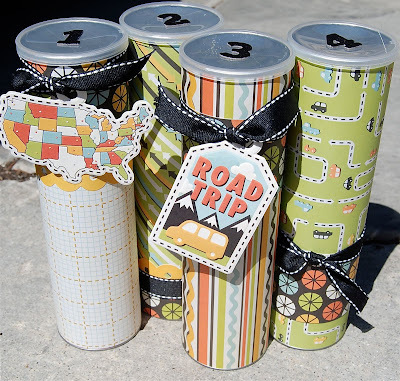 Fill these cans with treats, activities, games, a DS game they like to play, the title of a movie they can start to watch, lots of things to occupy your cuties for an hour! Another thought is to create new playlists on your ipod or in your CD collection and have them randomly chose a CD to listen to every hour if you don’t have a movie player in your car. 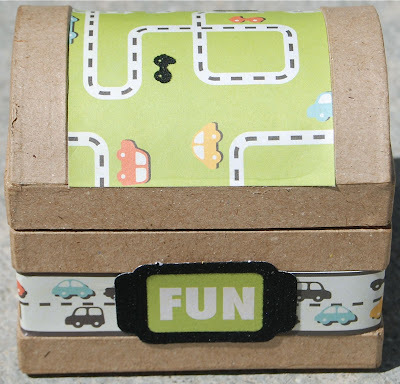 This is the link for the things you can print in these cans but there are hours of creative ideas on things you can do with your kids when in the car. Who woulda thought there would be so much? This site has fun games but it also has word searches and mazes that are fun to do! This site has a ton of games and some fun coloring pages. I even found some color by numbers! I also loved that they had a way to sort by age so you knew you were getting age-appropriate activities as well. They also have a 22 page book you can print off which makes a good variety! There are so many websites you can search through but I have ton quite a bit of research for you and think these are the best sites. They will be the most clean to look at and give you plenty of variety. Follow our blog or check back weekly because we do giveaways pretty much EVERY week! PLUS, we are a small company so until word gets out, your odds of winning are AWESOME! We are already giving away a kit (see previous post) so make sure to check over there and leave a comment to be in that contest. For this prize, simply leave us some lovin' and tell us what you like about the project. We will draw for a winner on TODAY at midnight (yep, you will only get TODAY to enter). 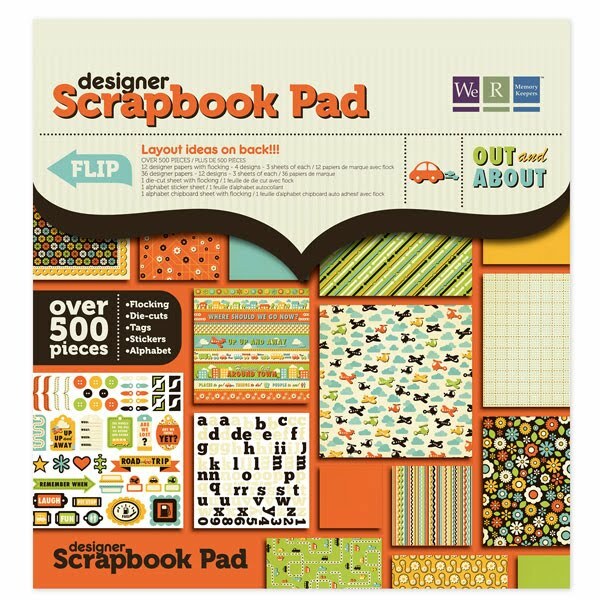 The lucky winner is going to get the Designer scrapbook pad and 4x6 pad that you will need in order to make these projects! I am leaving out of town on Tuesday so I will post the winner Monday night at midnight and the winner will need to email me with their address by noon on Tuesday so be sure to check back here. Join our mailing list on our website www.apage4allseasons.com Spread the word to your friends so they can take advantage of our weekly give aways! Join an autoship club and get 20% off ALL purchases! I love your travel activity ideas. I am always looking for ways to keep my kids entertained in the car! What a great idea for the road!! I love it! I think having a different can for every hour would be fantastic! So cute!! We have a trip coming up and I am excited to make ALL of these projects! What a great idea! I'll have to try to put something together before we hit the road for San Diego! I absolutely loved the Pringles cans in fact I already bought some to make the cans! Hopefully I can have them ready before we leave on Monday! Such great ideas! Love the idea about opening a can for every hour. I think my kids would really love that! Good colors and I think that it appeals to a wide range of ages. Thanks for the ideas! Would love to use them on our next road trip to UT! Super cute! I love the treasure chest idea with movie titles inside. I swear we spend twenty minutes just trying to decide which movie to watch! Great ideas! You are always so original. I love the travel chart. I'm going to make it for our trip to Disney in October. It will be great for my 3 year old to know where we are and when we are stopping. So cute! I am completely in love with the pringle's cans! It's that time of year again, time to start planning for your summer family vacation. Need some cheap travel ideas? Here are some of my favorite ways to save money on your next family trip.